Step 1 Place cashews in a bowl; cover with cool water by 1 inch. Cover bowl; refrigerate for at least 4 hours. Drain and rinse cashews. Place in a high-speed blender. Step 2 Bring a kettle of water to a boil. Place olive oil and garlic in a small unheated skillet. Turn heat to medium-low; cook, undisturbed, until garlic begins to sizzle. Let sizzle for 30 seconds, then transfer to blender. Add parsley, basil, oregano, lemon juice, 1/4 tsp. each salt and pepper, and 1 cup boiling water; blend until smooth (add more water if needed to reach desired consistency). Taste and season with additional salt and pepper, if desired. 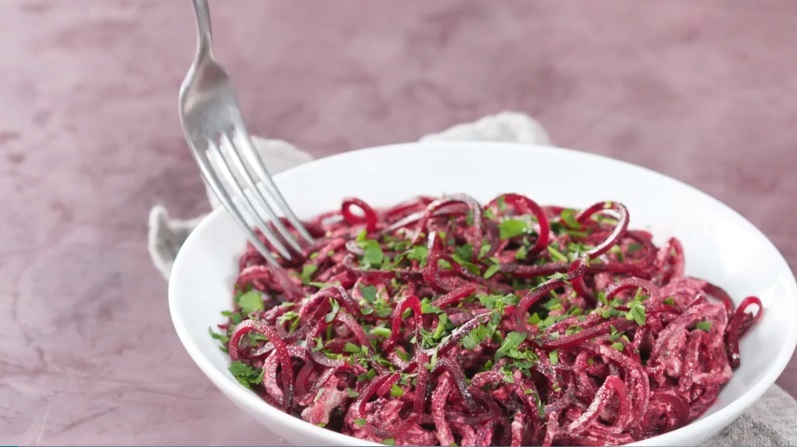 The best part: since the beet noodles are way lighter than your standard, processed white pasta, this dish doesn’t leave you feeling weighed down. And at only 306 calories per serving, you can feel really good about going for seconds. Want a taste? Add this simple two-step recipe to your dinner rotation for a gluten-free pasta alternative you’ll keep coming back to. Seriously, it can’t be beet!